Landmannalaugar is a pearl in the highlands of Iceland, situated in the nature reserve Fjallabak. Located at the edge of the Laugahraun lava field, which was formed during a volcanic eruption around the year 1477. Landmannalaugar is known for its beautiful landscape, geothermal hot springs and hiking trails - the surrounding nature is breathtaking. 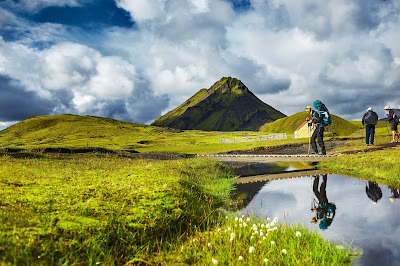 The most popular trails include a two-hour walk through the Laugahraun lava field to Mount Brennisteinsalda, a one, and a half-hour climb up Mount Bláhnjúkur, and a hike to the Ljotipollur crater lake that takes about four hours. 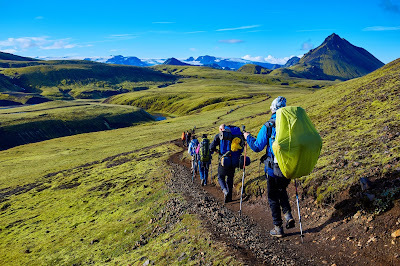 Landmannalaugar is also the starting point of many larger hikes; a hike from Landmannalaugar to Þórsmörk (5 days), to Hellismannaleið that leads to the volcano Hekla (4 days), and then crossing the desert plateau at Sprengisandur. At the heart of Landmannalaugar in the summer season, you'll find a camping site, and a hut run by the Icelandic Touring Association that can accommodate 110 people, in dormitories with showers and toilets. There is a "Mountain Supermarket", a converted school bus, which serves as a cafe and a small food store, you'll find their prices rather high. There's an agency that offers horseback riding tours. Mid / late June to mid-September you can drive from the Icelandic capital, Reykjavik, to Skaftafell or Myvatn (in July) to get to Landmannalaugar and stay a few hours or a few days. 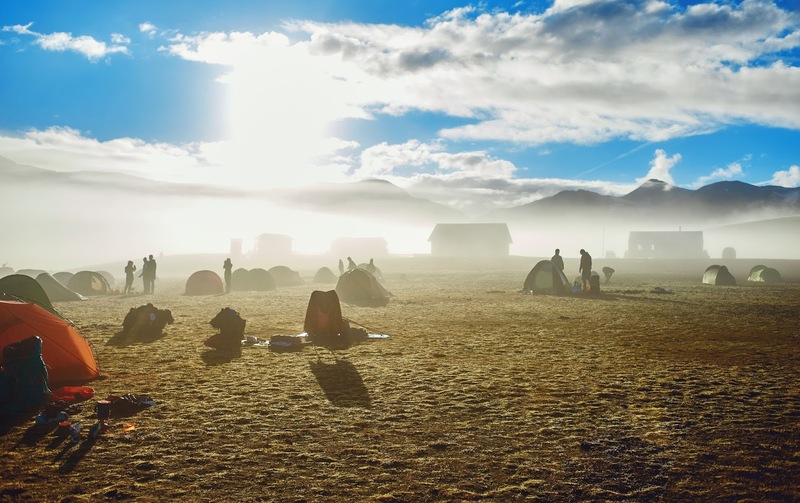 You can choose to join a guided tour where you learn a lot about the region and once there, you will be giving some free time to walk around, or you can soak in the hot springs at Landmannalaugar. See www.landmannalaugartours.com for more information. You can check road conditions yourself at www.road.is. The roads are open from mid-June to mid-September, although this can vary. Although a classic car might do the trick if you take Route 208 from Hrauneyar, north, we highly recommend you go there with a 4x4 because the road may be chaotic. If you go in a classic vehicle, you will need to park a little before the site because there is a small river to cross before reaching Landmannalaugar. The other two options don´t leave you with a choice but to go with a 4x4; you can take the road south F208, F225 or from the west, near the Hekla volcano. From October to May, the site is inaccessible to independent travellers, because snow is already present, but most travel agencies will take you there in their modified vehicles. The area is uninhabited and surrounded by snow, in the tour vehicle, you will feel like you are in another world. You can even spend the night in the shelter at Landmannalaugar. Be prepared to experience solitude and adventure ... and we hope you see the northern lights as you've never seen them before!